“If you want to hear some warm, exciting bass playing, dig John Goldsby.” Marc Myers, JazzWax.com. “A grand album, The Innkeeper’s Gun caters to the ECM way of jazz with a bit of a more modern approach, with hints of funk and hip-hop in a very subtle manner.” John Book, Book’s Music. “The quality of the playing is matched by the finely tuned recording technique that makes this CD a treasure.” Grady Harp, Amazon Top 10 Reviewer. CD Concept: “We’re carrying on the tradition of Ornette Coleman and Sonny Rollins, while expanding the trio style and adding our own voices to the music,” says bassist John Goldsby. 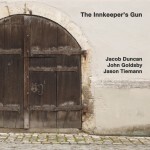 The Innkeepers Gun captures Goldsby, drummer Jason Tiemann and alto saxophonist Jacob Duncan in the middle of their 2009 European tour, and features jazz originals by Goldsby and Duncan, plus a cover of the hit pop tune “Paparazzi” from Lady Gaga. 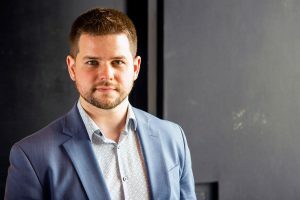 Goldsby, an American expatriate, has found better jazz opportunities since leaving New York and moving to Germany in 1994. He provides the bass foundation for many high profile recordings, including the recent releases Bombella (Abdullah Ibrahim), Symphonica (Joe Lovano), Roots & Grooves (Maceo Parker), and the Grammy Award winning Avant Gershwin (Patti Austin), in addition to the 2008 recording from Goldsby, Duncan, and Tiemann, Live at the Nachbar, The Visit (with pianist Bill Dobbins) and Goldsby’s recent Space for the Bass (both Bass Lion). Produced by: Robin Meloy Goldsby for Bass Lion. Musicians: John Goldsby (Double Bass), Jacob Duncan (Alto Saxophone), Jason Tiemann (Drums). Recorded November 12, 2009 at Topaz Studios, Cologne, Germany. Key markets: Louisville, New York, Cologne, Germany. Buy directly from John at Bandcamp.